The correct answer is “no one”, since Bigfoot doesn’t exist and all that, but this guy claims to have done it. Nearly a year ago a self-described professional Bigfoot hunter claimed to have shot and killed one of the creatures in San Antonio. The alleged incident was featured in a documentary released last year that left more questions than answers. [Last] Thursday Rick Dyer finally released pictures of the alleged beast’s body (see below). “Bigfoot is 100 percent real — there’s no question about that,” Dyer said. Dyer claims he shot and killed the mythical creature in a wooded area on the northwest side near Loop 1604 and Highway 151 in early September 2012. Until Thursday Dyer never provided any proof beyond a grainy video clip he shot of the big beast outside his tent. More video was included in the documentary “Shooting Bigfoot,” but it failed to impress skeptics. Despite a history of past Bigfoot hoaxes, Dyer insists he’s not fooling around this time. Dyer plans to hold a news conference in the coming days, where he will show the full body and release the test results. I’m sure he’ll allow an independent DNA analysis on his find. 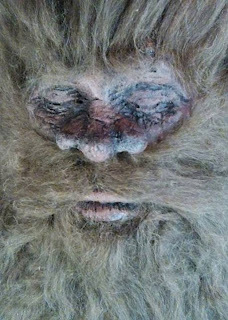 As the Bigfoot Evidence blog (the World’s Only 24/7 Bigfoot News Blog, because of course such a thing is needed) notes, Dyer most recently claimed to have shot a Bigfoot in Georgia in 2008, which he later admitted was a hoax. But this time he totally means it, y’all, even if his Bigfoot picture kind of resembles a dwarf from “Lord of the Rings”. Hey, you go to the media with the Bigfoot you have, not the Bigfoot you wish you had, am I right? Just show me the DNA test and we can settle this amicably. Dude, the “pork ribs from Walmart nailed to a tree” as bait was the best part. And I’m hoping that DNA analysis reveals a link between the dead ‘guy’ and Phil Robertson. Because that would explain so much.